I was having an essay crisis in late November. I felt trapped, unable to get my thoughts across properly; I was berating myself and berating the university lifestyle. It was during an extended, annoyed procrastination session that the news that the shooter of Michael Brown, Darren Wilson, would not be indicted, broke like a tsunami wave over Ferguson and the Internet. My self-absorbed stress immediately felt petty. Any frustration paled into insignificance in comparison to the anger I felt at the prejudiced injustice being all too obviously played out on the world stage. The educational requirements I was railing against, the very ability to feel frustrated at my University education, suddenly struck me as the privileges they are. I am a middle class girl, brought up in Oxford. I go to a Russell group University. I easily define myself as white British. The ‘prison industrial complex’ might be something I think about, read about and discuss, but it is definitely not something I have to confront in anything but an academic, theoretical way. I do not feel afraid of, or threatened by police. Even though I have been witness to racism, I have never been the victim. In my daily life, I am wrapped in a privileged, protective bubble-wrap against the visceral knowledge of racism, institutional or otherwise. The events in Ferguson, and the riots that followed, struck me, as they struck many others, because they brought crashing down any kind of rose-tinted sense that such blatant and endemic racism is increasingly a thing of the past. Then the police officer, clearly seen on video choking Eric Garner to the point of unconsciousness and eventual death, was cleared of charges. The promise that body-cameras would help to solve the ‘ambivalences’ in police shooting cases was dirtied. The repeated final words of Garner, spoken 11 times before the chokehold he was in suffocated him, rang in my mind. As for many others who flocked to the streets holding placards or wearing t-shirts bearing the words ‘I Can’t Breathe’, the words seemed to hold a horribly poignant, grave significance. I may not be able to express myself exactly, I may not be able to speak my mind clearly, let alone speak for others, but I am given airtime. I am given the space and the opportunity to voice my thoughts and opinions. I am frequently listened to. I am not personally stifled or suffocated by the system. 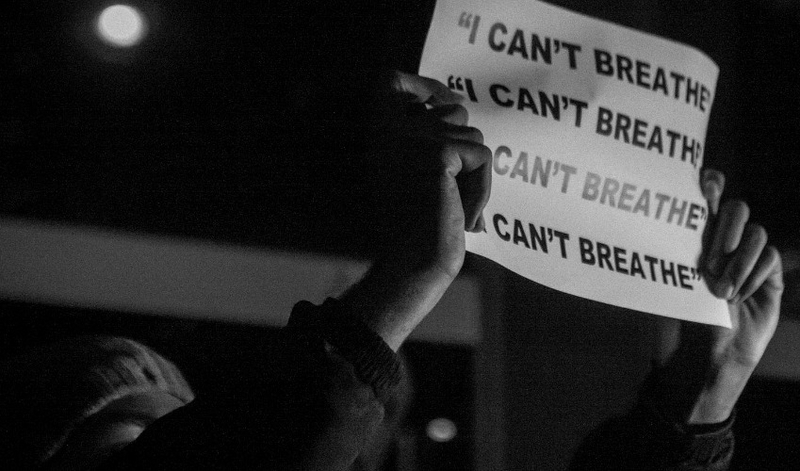 When will everyone, regardless of race or class, be able to take breath and say the same? I read this article and found it very interesting, thought it might be something for you. The article is called Choking – #poetscorner and is located at http://prancingthroughlife.com/2015/02/11/choking-poetscorner/.